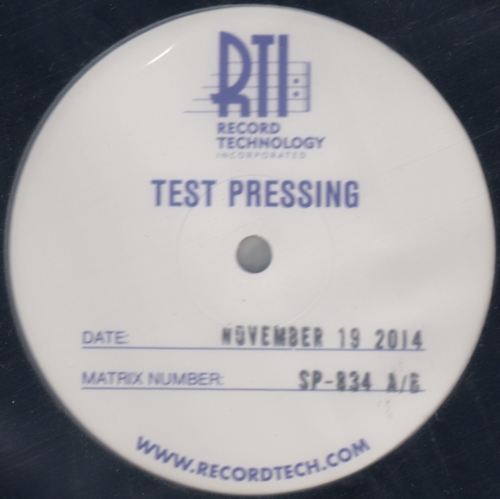 This is from a second run of test pressings of the 20th anniversay edition of Bleach . The record had been in print since 2009, and after some time new mother plates had to be made, so more stampers could be produced . The test pressings are on black vinyl with RTI test pressing labels on sides A and C, and white labels on sides B and D, and came in two plain black die-cut sleeves sealed together inside loose plastic. The pressing date and the catalog number are stamped on the labels. One copy has been found. The manufacturing history is the same as for the original pressing, as the new set of mothers were produced from the same set of fathers.